In a matchup of animal superpowers, a clever form of camouflage might beat super sight—at least in the ocean. There's nowhere to hide in the open ocean, far from the shore or the seafloor. But some fish have a clever disappearing trick. The silvery skin of fish like herring, sardines, mackerel and tuna act like mirrors, reflecting their watery surroundings to better blend in. The effect serves as a kind of underwater invisibility cloak that helps them hide in plain sight. Researchers have long assumed that some animals could see through this silvery disguise, thanks to a superpower of their own: the ability to detect a property of light—called polarization—that humans can't see. Octopuses and squid, shrimp and other crustaceans, and some fish such as trout and salmon all have the gift, called polarization vision. "It's kind of like wearing polarized sunglasses," said Sonke Johnsen, biology professor at Duke University and the first author on a new study of how well animals see reflective camouflage in the ocean. The polarization state of light changes when it bounces off a silvery fish's shiny scales. Scientists long presumed that this makes it easier for animals with polarization vision to make silvery fish out against the background, to eat them or avoid them. But the newly released findings suggest otherwise. 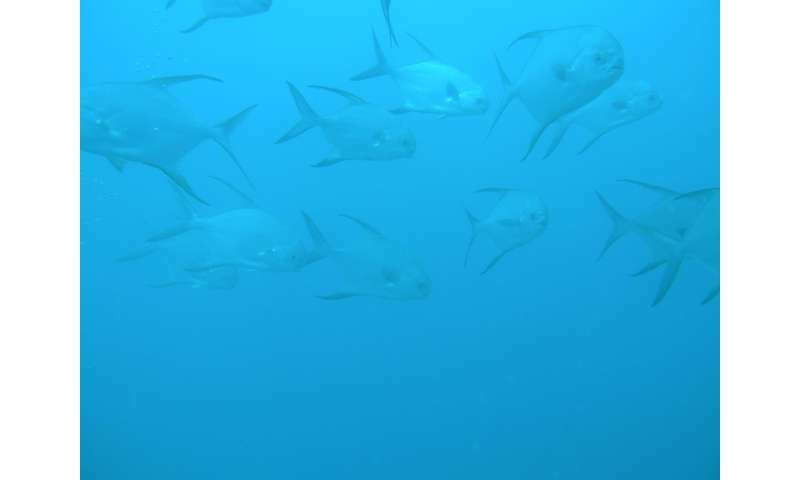 In a study published Aug. 22 in the journal Current Biology, researchers went scuba diving in the waters around Australia's Great Barrier Reef and took hundreds of pictures of silvery fish, including tuna, amberjack, barracuda and queenfish. The fish were photographed from six to 10 feet away using a custom-built underwater camera with tiny polarizing filters built into the sensor. The researchers used the images to measure the polarization state and brightness of the light reflected from the fish and the background water. By combining this information with a mathematical model of visual perception, they were able to calculate the maximum distance from which silvery fish can be detected using polarization vision versus a "regular" light cue like brightness. The fish did reflect a slightly contrasting polarization pattern with respect to the background water, which could theoretically betray their presence, the researchers found. But surprisingly, the data showed that polarization vision doesn't help animals spot silvery fish from any farther away than they could without this special sensitivity. "Sighting distance is important, because hunting and avoiding being eaten in the open ocean is about seeing other animals before they see you," Johnsen said. "Once you're seen, you're dead. It's over." If animals with this superpower aren't better equipped to spot a hungry tuna approaching from afar, then why do so many marine animals have polarization vision, and how do they use it? On land, this "sixth sense" is known to help insects and other animals find food, mates and suitable sites to lay their eggs. But in the ocean, now its function is less clear, Johnsen said. "There's a lot polarized light underwater, and there are all these ocean animals that can see it, but we have no idea why," Johnsen said. One possibility the researchers hope to investigate in the future is that polarization vision is most useful at close range, such as when assessing a potential mate. Up close, polarization cues could be used in combination with color vision and brightness to see other animals in more detail, Johnsen said.